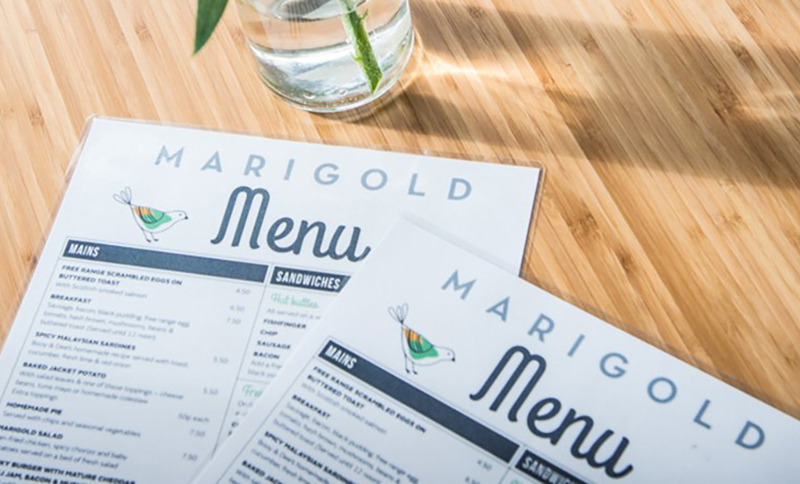 It all began when we decided to go for a new image to freshen things up down at Marigolds and create a beautiful space by the river for our customers to enjoy. Our new branding was the beginning of change. We were looking for a family fun feel that also brought a feel of nature reflecting our beautiful location on the River Nidd. Along came our little bird logo which felt like the perfect fit. The ball had started to roll, and over the last six months lots has been happening. We have new signage around the site, funky colourful furniture inside the café, our Marigold big bird on a sunny yellow wall and smart new uniforms. We have even been getting into posting on our Facebook page. I know, we can hardly believe it either! Fresh local produce is what folk are looking for these days, and we love that too, so our chef and his co-pilot have come up with some healthy, flavoursome and exciting new dishes that we’ve added to the summer menu to tickle your taste buds, and give a new twist to the offerings on Waterside.